« Spokes Bike Breakfast 2018 : Bike use at tipping point? 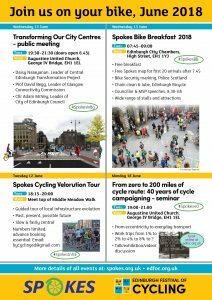 Spokes is putting on 4 great free events during the 2018 Edinburgh Festival of Cycling, including a major public meeting on Edinburgh Council’s Transformation project – and Glasgow’s similar Connectivity Commission. Full details below! June 12, 6.15-8pm Infrastructure ‘Velorution’ Ride [twitter #SpokesInfra] – good & bad; past, present, future. Meet top of Middle Meadow Walk. Book (free) by emailing bycycling@gmail.com. June 18, 7-9pm Seminar – Talk/exhibition/discussion [twitter #Spokes40] – Cycling in Edinburgh and the Lothians, past, present, future – based on our #Spokes40 research. How cycling went from 1970s eccentricity to present-day normal transport, and how to take it from here to mass levels. At Augustine United Church, Geo. IV Bridge. More details on the EdFoC website and in the EdFoC programme. The printed programme was included in our summer mailout to members (in late May). Put the dates in your diary now!! It is widely acknowledged that Edinburgh, despite having the potential of Scotland’s premier and most magnificent street, has lagged behind many other cities in creating a people-friendly city centre, attractive to leisure and business. The city’s public transport is good, but conditions for walking and cycling are in many cases dire. Previous Councils have identified and analysed the problem, but there was insufficient political courage for substantial action to be possible. The 2010 Gehl report called Princes Street a ‘bus station’ and George Street a ‘car park’ – but it was apparently too radical, with councillors deeming Princes Street too controversial to tackle and entering George Street into a never-ending series of consultations which, remarkably, continues consulting right up to the present day. 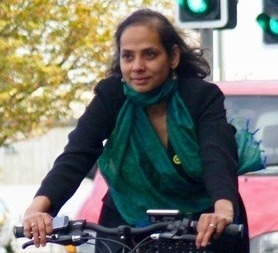 Daisy Narayanan, urban designer, architect and Deputy Director of Sustrans Scotland, has been seconded to lead the project to the stage of an action plan with short, medium and long-term proposals for decision by the Council in early 2019. Public consultation on options is planned for late this summer. There may also be short-term trial projects, for example during the Festival. For more on the background to the Edinburgh Transformation project, see the first section of this article. Also, this Evening News article by Transport Convener Cllr Lesley Macinnes. Meawhile Glasgow City Council, which arguably is already ahead of Edinburgh, with significant pedestrianised areas and growing provision of segregated cycleroutes, has set up a 12-month Connectivity Commission with similar aims to Edinburgh’s Transformation project, though perhaps somewhat wider. Prof David Begg leads the Connectivity Commission. 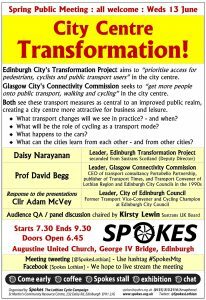 Now a UK transport expert, publisher of Transport Times, and former government adviser, back in the 1990s the then Councillor David Begg was Edinburgh’s Transport Convener (and a Spokes member). 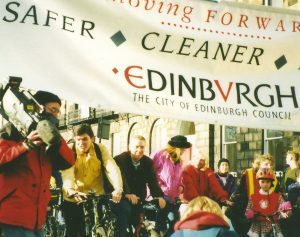 He was perhaps the City’s most radical holder of the post, taking what were then bold initiatives on buses, cycling (see picture) and walking – several of which, unbelievably, were dismantled or downgraded by subsequent councils to benefit less sustainable modes – including removing his Princes St cycle lanes and scrapping offpeak and Saturday bus lanes. 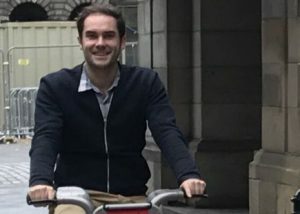 Cllr Adam McVey, City of Edinburgh Council Leader, and former Transport Vice-Convener and Cycling Champion, will at our meeting respond to presentations of the Edinburgh and Glasgow projects, hopefully giving a feeling for the way the Council is thinking, and their level of commitment to the project. Kirsty Lewin, a board member of Sustrans UK, will then lead an audience QA/ panel discussion with the three speakers, with the intention that everyone present – including the panel! – will learn from each other. Obviously the project is about more than cycling, though prioritising access for pedestrians, cyclists and public transport users is a basic element of the motion setting up the project [above]. Princes Street – a major rethink is needed on Edinburgh’s and Scotland’s premier street which, despite the car ban, still allocates much width to motorised travel, leading to squashed pedestrians, dangerous cycling conditions right beside the tramlines and loss of its potential as a superb place to enjoy. To enable wider footways and segregated cycling will almost certainly require a significant re-think on city bus routing. George Street – forms part of CCWEL (above) but is undergoing continuing separate consultations – it must include high quality cycle provision as part of CCWEL. Importantly, the aims of the Transformation project cannot be achieved without significant traffic reduction – both to provide a quieter, less fumed, safer environment, but equally to free up the space needed for quality pedestrian and cyclist infrastructure. For example, there are 3 north-south routes that cross Princes Street (Lothian Road, the Mound, Bridges) all of which cater for significant motor traffic, limiting the space allocated to walking and cycling. Some, or indeed all, of these may could have partial or complete traffic restrictions. This is where political courage will be needed by councillors – but there are policy reasons quite apart from the Transformation project. The Council’s Local Transport Strategy has very tough targets to reduce private motor traffic in the city – between 2010 and 2020 car is targeted to be cut from 42% of commuter trips to just 29%, and from 43% to 31% for all trips, with significant transfer to cycling, bus and walking. Whilst real-life data is moving in the right direction [census, Spokes 10-year count series] it is still well behind the target levels. Transformative action is essential if this level of traffic reduction is to be achieved.